Why is Good Friday good? It may seem an odd question. We are all familiar with the events of Our Lord’s Passion. We have heard the story so many times that it is easy to take it for granted. Is it not the case that we must often return to those things we are much familiar with to take them up again lest we risk growing indifferent toward them? What I propose to do is not to present anything new but simply to sound the depths of the mystery, which the Church calls us to live again this Sacred Triduum. I want to go ever deeper into that same depth into which we plunge every year. Why is Good Friday good? It seems on the surface to be a paradox. What happens on Good Friday? On Good Friday the Church reflects on the passion of our Lord—the suffering, death and burial of Christ. And we call it Good Friday. To get at the heart of Good Friday, to contemplate its goodness, we must draw close to the Word of God. 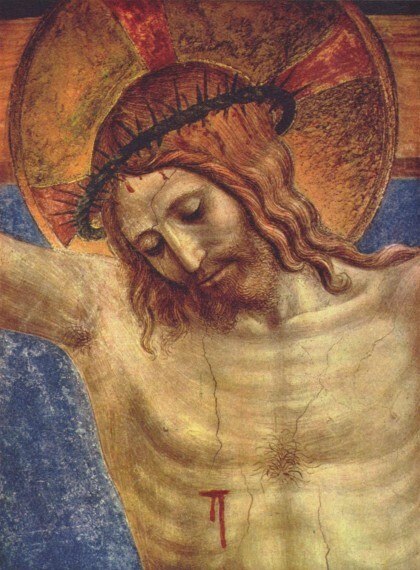 I do not think that the question of the goodness of Good Friday is unique to us. Why is Good Friday good? The early Christians too were concerned with this question. It is not a modern question. Yes, I do think that the early Christians would have asked this question. The reason I think so is because one of the earliest attempts to give an answer to this question comes at the very end of the Bible. In a way the whole of Sacred Scripture concludes with a reminder of the answer to this question. Why is Good Friday good? It is in the Book of Revelation. This is the earliest of the Johannine texts in the New Testament. It is written by the one Apostle who Christ remained at the foot of the Cross—and there received the treasure of the heart of Jesus crucified (Jn 19: 25-27). I propose that we turn to the Beloved Disciple and ask him to help us enter more deeply into the contemplation of the Holy Cross. It is not immediately clear what this scroll is. On this scroll there is writing, on the outside and on the inside. This symbolizes fullness. Whatever is written is complete. There is no room for any additions by the author of the scroll. This scroll held in the right hand of the one who is seated on the throne. We know that the one seated is “our Lord and God” who did “create all things” (4:11). This scroll is sealed with seven seals. But we don’t yet know what is contained within the scroll. Then an angel appears whom calls forward any that would present themselves as “worthy to open the scroll and break its seals” (5:2). What we know, and what John sees, is that “no one in heaven or on earth or under the earth was able to open the scroll or look into it” (5:3). This must be our first clue as to the contents of the scroll. Those who attempted to open the scroll come from three places: heaven, earth, and under the earth. By heaven is signified the angels—those pure intelligences who in the first moment of their creation freely accepted the gift of God’s Beatitude. The earth would signify men. And one by one the greatest men that the human race has ever produced come forward so as to present themselves as worthy to take the scroll and break open its seals. But no human person is found worthy. 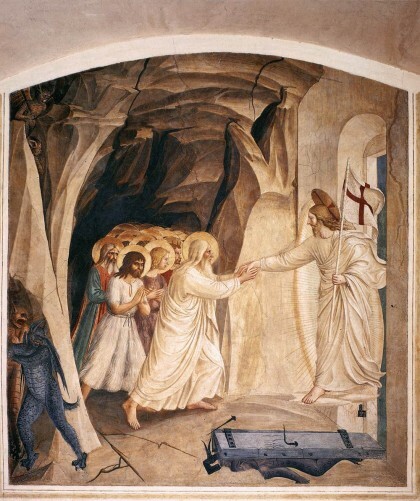 By those “under the earth” are meant the demons—those angelic beings who in the first moment of their creation, when present with the free choice of God’s Beatitude, turned from God and are now fallen. And what John witnesses is that the greatest of all God’s holy angels; and that the greatest men of the earth; and the mightiest of the demons are not worthy to take the scroll from the right hand of the Lord. They are not worthy to take the scroll and break open its seals. And this causes John to weep with despair (5:4). And this is our next clue as to what this scroll is. Whatever it is, it must be opened. It must be broken open. And no one can do it. No one, no thing in all of creation, is worthy to take this scroll and break open its seals. Who is the Lamb? The song is instructive. For what reason is the slain Lamb worthy to take the scroll and break open is seals? The elders and the four living beings proclaims the reason in their new song: “for thou wast slain and by thy blood didst ransom men for God from every tribe and tongue and people and nation.” The Lamb is Christ who appears slain—that is, Christ on the Cross. This vision which John is asking us to enter into is a vision of the Cross—but the Cross seen under a certain light. John gives witness to the adoration of Lamb by every creature. Only the crucified Christ is worthy to take the scroll. Only He whose death possess an infinite value, such that it might atone for the sins of every man who had lived, was living, and would ever live until the end of time. But what then is the scroll? When we consider all this I believe it comes into view. The scroll is the mystery of the world in God. It is the story of the whole of creation and it is the answer to all the questions that burn in the hearts of men. Who am I? What am I for? Why am I here? Where am I going? What will become of me? What is expected of me? The scroll represents not just my world but also the whole world. Why is there something rather than nothing? Why is there suffering? Why is there evil in the world? And why do some men benefit from evil? Why does it seem so often that there is so much darkness and so little light? Why do children suffer? Why do the poor seem to know no justice? Why do the weak suffer at the hands of the strong? Why do the good know short lives filled with much suffering while the wicked ones know long life filled with seemingly many joys? It is the design of God, kept secret till now—until this most holy night. It was a secret because it is a design brought forth from the very heart of God. It is the manifestation of the very inner life of God. And the disclosure of the inner life of God by the Lamb who was slain is total. We have no wisdom but the Cross. So the writing on the outside of the scroll and the writing on the inside represent a fullness of the disclosure of the design of God for the world. That’s what the Lamb who is slain is worthy to break open. Christ crucified, the Lamb who is slain becomes our light—that which allows us to see the truth of things (Rev 21:22-26). The Lamb who John sees in his vision is a kind of symbol for Christ crucified. But it is a symbol that operates by pointing out one fundamental aspect of the crucifixion. And that is the aspect of victim. Christ is the Pascal victim. He is the paschal sacrifice. He is a blood offering to God for the sins of man. So the crucifixion is a kind of holocaust. It is a holocaust to the Father to atone for the sins of the world. And this holocaust victim unlocks the mystery of the world in all its darkness—in all its iniquity, in all its seeming incomprehensibility. So this is the first major aspect of the crucifixion. The first thing we must understand about the Cross is that it is a sacrifice. A holocaust. This holocaust is the source of the joy of all the blessed in Heaven. The mystery of the world in God: Christ unlocks it, Christ reveals it to us. He is a light shinning for us. It is the deepest desire of every human heart to be known, to be understood, to be chosen, to be forgiven. Put simply, to be loved. This is the goodness of the Cross—that which makes Good Friday truly good. 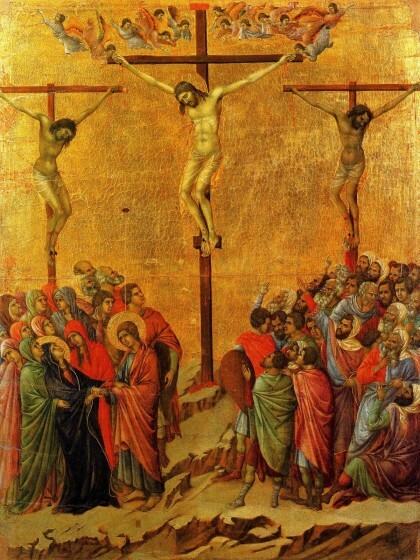 For the Church Militant each day is Good Friday, lived in the surety of the Faith. That is, in the presence of the Lamb. 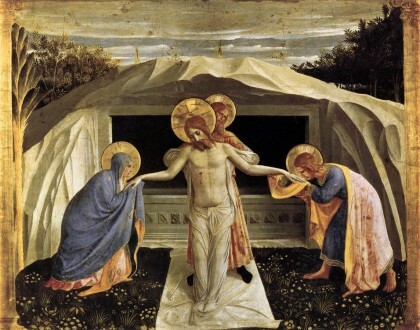 Let us then cling to the Crucified One as we enter into the glory of Easter. Let us live this holy night in the light of the glory of the Lord God the Almighty; and by the lamp who is the Lamb. Alleluia. Amen.